Today in Masonic History Joseph 'Joe' Mercer is born in 1914. Joseph 'Joe' Mercer was an English football (soccer) player and manager. Mercer was born on August 9th, 1914 in Ellesmere Port, Cheshire, England. His father passed away when Mercer was 12 years old. His father passed away from health issues that were caused by a gas attack during World War I.
Mercer started his career with Ellesmere Port Town, the local football club in Ellesmere Port. From there he started playing for Everton when he was 18 years old. During World War II he was made a sergeant-major and played in 26 wartime internationals. In 1946, Mercer left Everton and began playing for Arsenal, a football club that is based in Holloway, London. 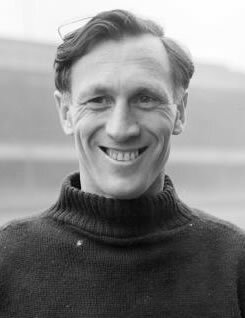 He would finish out his playing career with Arsenal, ending his run with them in 1954 after colliding with a teammate and breaking his leg in two places. He played 275 games with Arsenal alone. After Mercer ended his playing career, for about a year, working as a journalist and grocer. In 1955 he returned to football as a manager. First for Sheffield United, in 1958 he moved to Aston Villa and remained there until 1964 when he suffered a stroke. After he recovered Aston Villa let him go. Despite his health issues he continued to work as a manager, which included the England national football team where he was caretaker manager. In later life, Mercer suffered from Alzheimer's disease. He passed away in his favorite armchair on his 76th birthday, August 9th, 1990. Mercer was a member of Rivacre Lodge No. 5805 in Ellsmere Port, Cheshire, England.